It’s become sort of fashionable to disrespect pumpkin this time of year, mocking its widespread popularity. I recently saw a photo of a Mexican restaurant featuring a marquee sign that read “Pumpkin Spice Tacos Are Here!” I inwardly groaned, trying to imagine how that would taste, before I read the fine print, which read: “Just kidding. Drink Tequila.” While I’ll admit that I’d be hard pressed to find a way to make a pumpkin spice taco taste good, I stand behind my love of all things pumpkin spice-flavored, even if it marks me as someone who follows trends, rather than setting them. One of my kids is a pumpkin lover too, and it’s not unusual to get a request from him for a batch of pumpkin cookies – my all-time favorite use for pumpkin -- in the first blush of spring or the heat of July. He’s learned how to make them himself, and if I’m feeling up to coaching him through the kitchen cleanup process, he often does just that. At his urging we’ve tested various recipes for pumpkin pancakes, pumpkin bread, pumpkin muffins, pumpkin scones . . . well you get the idea. We’re always game for trying new ways to use pumpkin around these parts, so I’m perpetually on the lookout for ideas. I’ve had a fair number of pumpkin spice milk steamers at local coffee places, and I’ve always liked them. Rich and creamy, they remind me of a luscious slice of pumpkin pie poured into a cup. However, I’m pretty sure that most of those drinks that I’ve enjoyed were made with a pumpkin-flavored syrup, rather than actual pumpkin, so when various recipes popped up online for a homemade version I was excited to give it a try, using wholesome ingredients. When I made these at home, I poured them into mugs and garnished them with homemade whipped cream. My kids and I used them to dunk cookies, warming the first of winter’s chill off our fingers by gripping our cups. My pumpkin-loving son drained his mug quickly, declaring the drink a total success. When I suggested that perhaps the drink could sub in for our pumpkin pie this year at Thanksgiving (since I’ll also be making an apple, a banana cream and possibly a chocolate pie) he gave me a look that suggested I’d gone completely mad. Despite his obvious disapproval, I’m still holding out for that option. A treat that’s rich and creamy, perfect for the season and easy-as-pie to make. What could make for a happier holiday than that? 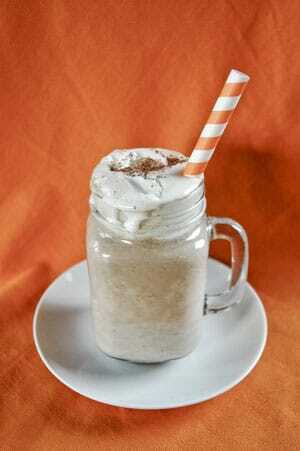 In a blender, combine milk, sugar, pumpkin, maple syrup, pumpkin pie spice and vanilla. Blend until all ingredients are completely incorporated, about two minutes. Pour directly into a medium saucepan and warm over low heat for about five minutes, stirring constantly. Pour mixture into serving mugs and garnish with sweetened whipped cream and a dash of nutmeg. Note: Don’t skip the maple syrup. It gives the drink a subtle depth of flavor. 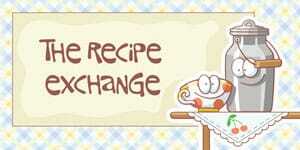 This recipe is quite sweet; decrease the sugar according to your preference.